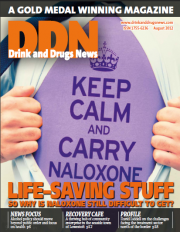 Nearly 3,500 naloxone take-home kits have been issued in Scotland over the past year, giving the chance of emergency treatment for overdose that has proved to be life-saving – but our cover story shows, there is still a way to go. Naloxone remains prescription only and not commonplace in environments where an overdose is most likely to happen. CRI services in Sefton and Brighton have demonstrated that service users can be effectively equipped with take-home kits alongside their prescriptions, but it’s surely now time for the law to catch up with practice and make it routinely available so it can it fulfil its life-saving potential. In our News Focus this issue we asked whether the constant focus on binge drinking could be detracting from a greater understanding of its effects on health; we heard some inspiring versions of recovery in prison and the community; and asked Prof John Strang to explain the recommendations of the expert group on medications in recovery. Does a preoccupation with binge drinking mean health is being overlooked? The ACMD regards naloxone as an intervention that saves lives – yet it remains prescription only. David Gilliver hears from a service that’s calling for provision to be rolled out. Bill Nelles remembers friend, colleague – and former DDN columnist – Bri Edwards. Also readers’ letters and the legal column. An expert group has made recommendations on reorientating drug dependence treatment to fit the recovery agenda. Its chair Professor John Strang explains. Ian Houghton describes how private prison Forest Bank is demonstrating success with its focus on achievable recovery options and reintegration.